When I was a child, I was perfectly happy with Cracker Jacks. Now that I’ve tasted some of the finer things in life, I have higher standards. But I still get a kick out of caramel corn. A bag of Moose Munch – a posh version of the childhood treat, embellished with cashews, almonds and dark chocolate – finds its way into our basket whenever we shop at the Harry and David’s outlet. It’s an extravagance, though, at about $8 for a small bag, and there’s usually only a few crumbs left by the time we get home. So this year I decided I would make my own for the holidays. Prepared with freshly popped corn and homemade caramel, this version will give you a whole new perspective on caramel corn. It’s crunchy, sweet, a little bit salty, and downright fun to eat. It’s also inexpensive to make and a great gift. I’ve been taking it to parties and even skeptics are soon happily munching away. Replicating a commercial recipe is never easy. It took three tries to come up with a version close enough to the original to make me happy. I needed a light caramel that lets the flavor of butter shine through. But my first two tries, using brown sugar both times, were just too dark and heavy. When I switched to white sugar, everything clicked. This version may even be better than the original. The ingredients are all high quality and there’s only enough corn syrup to prevent the sugar in the caramel from crystallizing. I realize making candy can be daunting. There’s usually all that fussing with the candy thermometer, which never seems to be accurate. If you don’t cook it long enough, it won’t set. Yet if it stays on the heat a minute too long it burns. Don’t worry. You can use a thermometer, if you want, to make the caramel, but it isn’t essential. Watch the time and the changing color of the sugar closely and you’ll be fine. Just be sure to wear long sleeves and heavy oven mitts when you pour the syrup over the popcorn. Boiling sugar can leave nasty burns if you’re not careful. Pop the corn any way you like. I’m attached to my old air popper but the microwave works just fine, although you’ll have to work in batches. (Place about 3 tablespoons of corn kernels in a brown paper bag, say a large lunch bag, fold the top over a couple of times and cook on high until the kernels stop popping – about 2 minutes. Don’t use commercial microwave popcorn, which introduces off flavors.) Or do it the old fashioned way and heat a couple of tablespoons of oil in a heavy 3-quart pan over moderate heat, add the kernels, cover the pan, and shake until the corn stops popping. The secret to the great crisp texture of this caramel corn is baking it in a low oven for an hour once you’ve mixed the syrup with the popcorn and nuts. After it has cooled thoroughly, dip some of the clusters in melted chocolate. Good chocolate chips work well. I use Ghirardelli’s 60 percent cacao bittersweet chocolate chips. If you want to splurge, try chopping up a couple of bars of premium dark chocolate instead. There’s plenty of room for creativity here. I like cashews and almonds, but macadamias and pecans also are great and salted peanuts are classic. If you don’t care for really dark chocolate, use semi-sweet or milk chocolate, although the latter may be a little soft for the job. When you’re done, you’ll have about four quarts of candy. It looks like a lot, but believe me, it won’t last long. Caramel corn isn’t just for kids anymore. Preheat oven to 250 degrees. Butter a large roasting pan or a couple of rimmed baking sheets. Combine popped corn with nuts in roasting pan and place in oven while it heats up and you prepare the caramel. In a large, heavy saucepan (at least 3 quarts), combine butter, corn syrup, sugar and salt. Measure baking soda and vanilla into separate small bowls and set them nearby. Bring syrup mixture to a boil over medium heat, stirring with a wooden spoon or heatproof spatula just until mixture begins to boil. Then let it boil without stirring until syrup begins to turn a light golden brown. This should take about 8-10 minutes from the time you begin to heat the mixture. Watch it carefully. Once the syrup begins to take on color, it can get too dark in the blink of an eye. If you’re using a candy thermometer, the syrup should register between 230 and 250 degrees when it’s ready. Test your thermometer for accuracy first by inserting it into boiling water for 10 minutes. It should register 212 degrees. If it’s higher or lower, adjust your target temperature for the candy down or up by that many degrees. Remove syrup from heat and stir in baking soda and vanilla. The mixture will bubble up and expand. Immediately, pour syrup evenly over the popcorn and nuts in roasting pan and stir to coat evenly. It helps to use two spoons or spatulas at this point. Return caramel coated corn and nuts to oven and bake for 1 hour, stirring every 10 or 15 minutes. Remove from oven, let cool and break into clumps. When caramel corn is completely cool, melt chocolate in a double boiler or a heat-proof bowl placed over a saucepan of simmering water. Do not let water touch bottom of bowl. Stir occasionally, until chocolate is evenly melted. 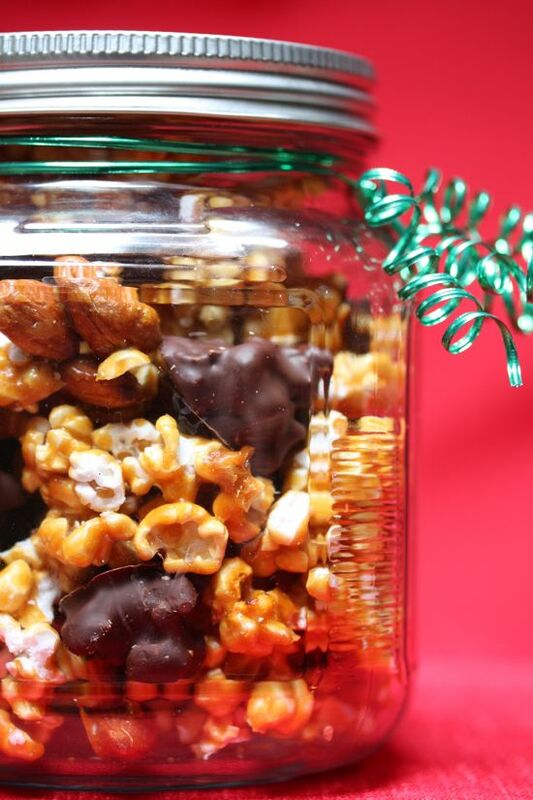 Using two tablespoons, dip small clusters of candied popcorn and nuts into the warm chocolate, one at a time, turning to coat evenly and then allowing excess to drip back into bowl. Place chocolate coated clusters on a baking sheet lined with parchment or waxed paper to cool. 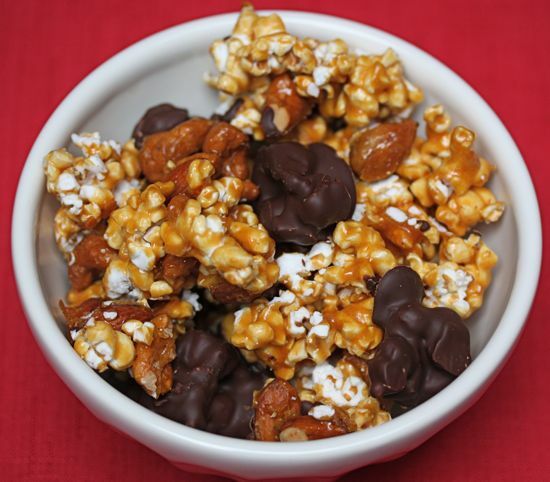 When chocolate is firm to the touch, toss the clusters with the remaining caramel corn. Alternatively, you can drizzle the chocolate over the caramel corn but the presentation is not as attractive. Store in an airtight container for up to a week – if it lasts that long. Aleta, you are speaking my language. I declare a Caramel Corn Day at my house.